'Wanderlust': Best (or Worst) Movie Starring a Real-Life Couple? Unless you’ve been living under a rock – or in some alternate, celeb-gossip-free universe – you know that Jennifer Aniston and Justin Theroux are officially a couple, and soon we get to see how much onscreen chemistry they have, in the David Wain-directed Wanderlust. The critical reaction thus far has been fairly mixed (we liked it, though! ), and movies starring real-life couples in the past have been similarly hit-or-miss. Here are some of our favorites – and least favorites. Considered by some to be the worst movie ever made (and not in the Showgirls sense, where it later turns into a cult hit), Gigli was laughably bad in so many ways – but the chemistry not shared by then odd real-life couple Bennifer is most alarming. It’s also worth noting that Martin Brest is still in director’s jail for Gigli. 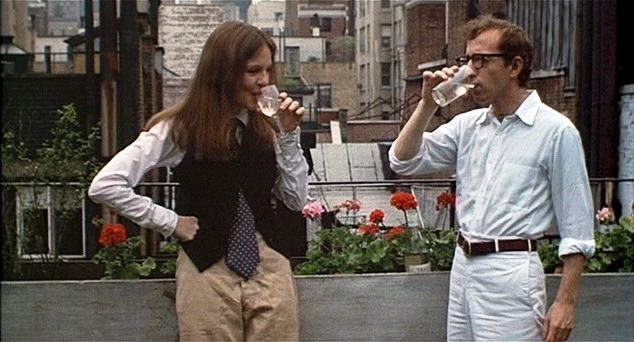 Woody Allen did a masterful job co-crafting a great, somewhat groundbreaking screenplay in addition to directing the film – but Annie Hall wouldn’t be what it was in 1977 and still is today if not for the palpable chemistry between onetime real-life couple Allen and Keaton (whose actual last name is, you guessed it, Hall). Aside from Best Director, Screenplay and Picture, the beloved rom-com netted Keaton a Best Actress Oscar and Allen a nom for Best Actor. Clearly the Academy was as touched by the on-screen relationship as moviegoers were. When Eyes Wide Shut – which has to be considered, at the very least, Stanley Kubrick’s most uneven movie – was released, it was positively shocking to see THE celeb couple at the time appearing in a decidedly adult, unmarketable film. Tom Cruise and Nicole Kidman’s on-screen relationship was odd and a downer overall, which can also be said about their permanent separation a couple years after the release. At one point before this biopic about salsa legend Hector Lavoe was released, the film was touted as a proverbial Oscar vehicle for Anthony. The expectations wound up vastly exceeding the end result, and people had much more interest in J. Lo and Anthony’s off-screen relationship than the on-screen version. Hell of a soundtrack, though – if you like salsa music. To hear Brad and Angelina tell it, they were NOT a couple during the filming of Mr. and Mrs. Smith. Whether or not you believe them depends on whether or not you’re a member of Team Aniston, but the chemistry they shared (and star power they oozed) as secretive spouses certainly helped keep the otherwise silly movie intriguing – and, of course, helped turn it into a blockbuster. “What’s in the bo-ox? !” That’s what most people remember about the on-screen relationship between off-screen lovers Pitt and Paltrow in this classic David Fincher thriller. It was more of a side-plot to the story – that is, until Gwyneth’s “pretty head” was needed for the climax – but there was definitely a tangible believability to David and Tracey Mills’ relationship, which isn’t always the case when real-life couples take their romance to the screen. Will and Jada have been together for what feels like a lifetime – constant rumors of their imminent or past separation notwithstanding – and that more than translated on the screen in Ali, in which he played boxing icon Muhammad Ali and she his first wife, Sonji. Alas, they later divorced, hopefully NOT like the couple that played them. It’s almost hard to believe that these two were, in fact, once (briefly) engaged in real life, but that pales in comparison to their even weirder romance in Me, Myself & Irene. Which isn’t to say that their pairing wasn’t funny, or that the movie didn’t have some Farrelly brothers magic, but they just seemed mismatched, and not in a comedic way.